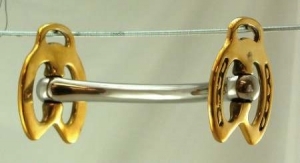 All the mullen mouth bits that we offer are high-quality horse tack products. Not only are these bits made of high quality material they will also provide maximum comfort for your horse. Treat your horse with this comfortable product and go for a ride today. This Horseshoe Mullen Mouth Stallion Bit spreads pressure on the horses mouth instead of pain. We only sell top quality equine products here at our online store. This mullen mouth bit is one of the most popular products we have to offer due to lots of positive feedback from our customers.